The Information Systems & Engineering (ISE) group is a “joint venture“ of the research groups of Prof. Dr. Alexander Mädche (Information Systems & Service Design) and Prof. Dr. Christof Weinhardt (Information & Market Engineering) at the Institute of Information Systems and Marketing (IISM). In six research departments Electronic Markets & User Behavior, Digital Experience & Participation, Intelligent Enterprise Systems, Information Systems Engineering & Transformation, Business Data Analytics, and Smart Grids & Energy Markets interdisciplinary researchers work together in order to accelerate digitalization of businesses and society. With its high-quality research output the group provides a solid foundation to realize the IISM vision “to create value from information“. With its education offerings, ISE contributes to the Industrial Engineering & Management and Information Engineering & Management programs of KIT. Addressing real-world problems and transferring state-of-the-art knowledge to practice is considered as essential. 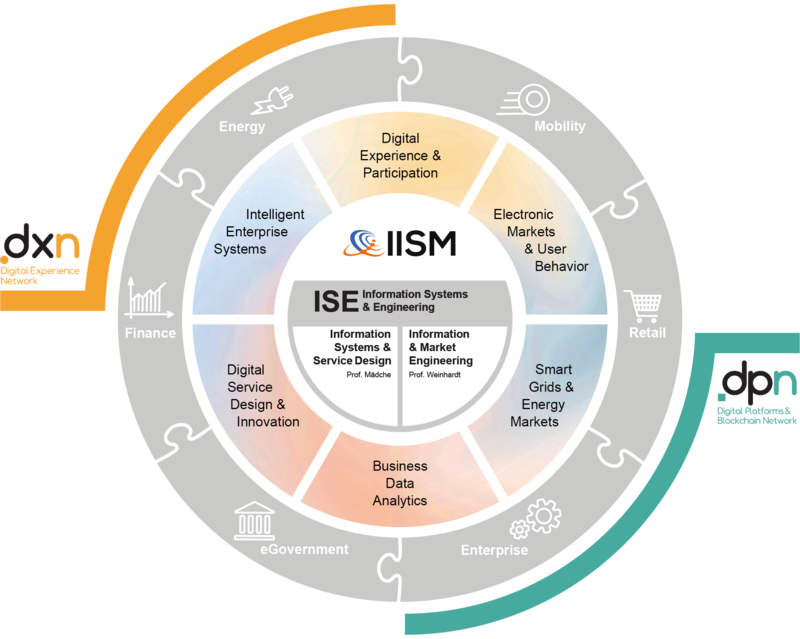 ISE tightly cooperates with industry within two networks (Digital Experience Network, Digital Platforms and Blockchain Network) and six domain-specific hubs (Energy, Enterprise, E-Government, Finance, Mobility, Retail).